11-year-old Macy Hartjes has a passion for painting. "There's so many things you can do, and it's really fun, and I love being creative." The 5th grader is sharing her talents by holding art classes for kids in her Grand Chute home. "I love teaching things and helping other people learn about stuff." She also likes helping people in need. Macy uses the money she earns from her art workshops to buy supplies for Homeless Connections . So far, she's donated about $1,000 worth of food, personal hygiene items and other necessities to the homeless shelter in Appleton. "My mom, she worked at a school and lots of her kids they went to Homeless Connections. They didn't really have a lot, and I have a lot, so I just wanted to give something to them." "That's the goal I think as a parent is to try to lay the foundation and hope that they can take that and run with it," said Jessica Hartjes. "To watch her be a leader and know that she can make a difference is a proud mom moment." Last year, Macy's philanthropy caught the attention of Shopko leaders who chose her as one of the 10 winners of their Kids Making a Difference Kick-Off Kids contest . "I don't think these kids have any idea of the impact that they're making in their community. It's just so inspiring and it's great to honor them and recognize them for all that they're doing," said Michelle Hansen, Public Relations and Shopko Foundation Manager. The Shopko Foundation supported Macy's cause by giving a grant to Homeless Connections in her honor. As the Kick-Off Kid, Macy received four tickets to the Lions vs. Packers game last November. Her picture and story of her community service project appeared on the game day program. 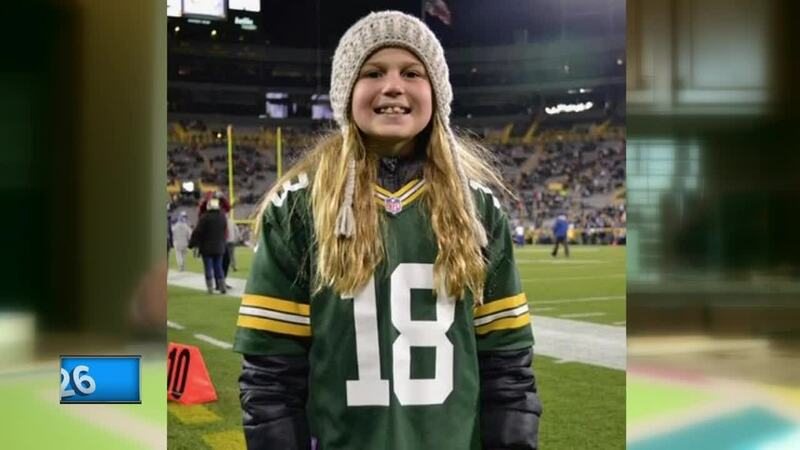 She also got the once-in-a-lifetime experience of running onto historic Lambeau Field, with 80,000 fans screaming in the stands, and retrieved the football tee after kick-off. Her big smile was shown on the TundraVision screen for all to see at the stadium. "I was like scared and excited at the same time, so it was a mix of feelings. It was just crazy," she explained. Her mom described the moment this way. "Breathtaking. It is," she said. "You get the lump in your throat and just taking it all in. It's just like that magical moment that happens so quickly and you just want to push pause, because it is kind of a little bit of an out of body experience." Now it's back to reality, but as Macy prepares for another summer of art classes and helping the homeless, the Hartjes family will always treasure Macy's experience as Packers royalty for day. They're also encouraging others to apply to enjoy the same amazing opportunity. Shopko is currently taking applications for this year's Kick-Off Kid. To be eligible, the child must be between six and 12-years-old. They must write a short essay and have a form filled out by a reference . The deadline to apply is June 2nd.